The truth is Vimeo isn’t late to the party. Instead, Vimeo has been privately working on 360 for some time, as they believe it’s more important to do it right than be the first. And, now it’s coming. Unlike any other 360 platforms, Vimeo 360 offers eleven features that might make it as a winner of the 360 platform. 1. Are you a 360 video enthusiast? ’Cause Vimeo 360 offers you lessons via 360 Video School. Since 2004, Vimeo has identified its platform as a home for high-end content. So, it’s not a surprise that a new Vimeo 360 Video School is providing you basic and in-depth tutorials, where you can learn more about 360 cameras, pre-production, shooting, and editing. And, the good news is that these tutorials are free to anyone. 2. With Vimeo 360, you can monetize your 360 content and get 90% of the revenue generated. Unlike its competitors, Vimeo allows you to make money from your content. So, here’s how it works: If you have a PRO or Business membership on Vimeo, then you can choose to sell your videos, rent them, or offer them a subscription. No ads. You know, people hate ads, therefore, this might be a good solution for now. Also, as a creator, you can keep 90 percent of the revenue generated. Note that it’s after the transaction costs. 3. Vimeo 360 has also added customizability for advanced features on your 360 content. This feature enables you to set the field of view, outro, default orientation, and other features. Yes, you can upload your 360 videos as a monoscopic or stereoscopic video with a resolution of up to 8K. 5. And, it’s relatively easy to upload. If you upload a 360 video, just simply upload it and check a “this video was recorded in 360” box. 6. The service also supports direct uploads from Adobe Premiere Pro and Sony Vegas. 7. Basic but important, it’s accessible on the web and on the company’s iOS and Android mobile apps. 8. And, it’s relatable for everyone, as for now, it works with Samsung Gear VR, BeThere Book (Cardboard-compatible), and Google Daydream. The company says support for the Oculus Rift and HTC Vive are coming soon. 9. 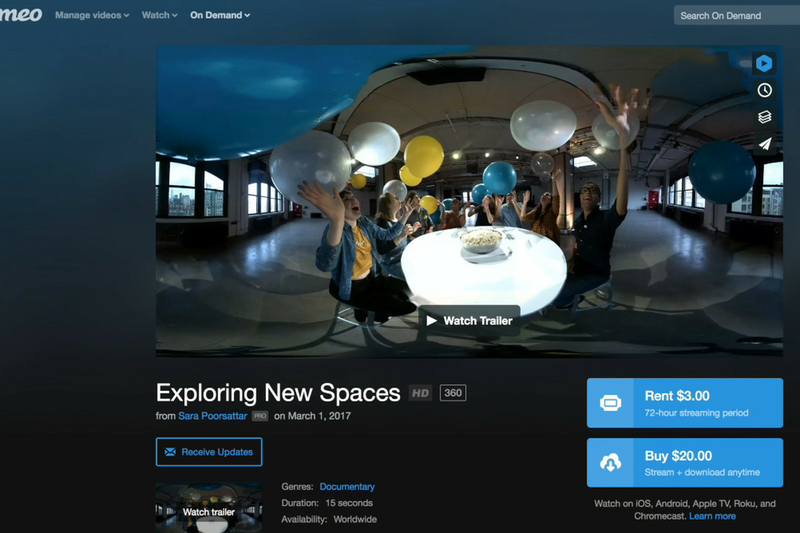 Vimeo 360 allows offline viewing in up to 4K. 10. Vimeo 360 has shared and curated its favorite 360 clips in a dedicated channel. Yours could be one of them, so take a look at them here. 11. Unfortunately, no live 360-degree broadcast yet. So, do you think Vimeo 360 is the winner of the 360-degree platform for now?